Talking to Eileen Carey is like talking to your best friend, number 1 hit in Country is definite someone you love for personality. It was easy for me to connect with her and in all the work she does now in promoting her album she took some time of to do this interview. In reading this interview it feels almost like a miracle that she found time to answer my questions. If I interview someone I want to go down to the bottom, my goal is to introduce the person behind the hit, the job, the name. So that we get a change to get to know the real person. This interview presents a famous actress and singer who could be the girl next door and I truly believe she is. If you want to listen to her, sit down and listen to the fastest growing Country artist of this time. Eileen was interviewed by Take 2 Radio in January 2012. Listen to the entire podcast here. If I Google Eileen Carey I find a very talented awarded lady, did you start as an actress or singer tell us more? Actually Isabel. I started singing in school and community events and performances long before I engaged an acting career. Fact is I played drums as a kid and I still do. These roles Hoffa, Basic Instinct and the original Batman movie, and my stint with the original “Uh-Huh Girls” supporting Ray Charles in a national Pepsi advertising campaign with a Super Bowl airing, all came as an accident to pursuing my other dream, directing film! You played in the movie Basic Instinct, what boost did this give your career? It did, it added some more confidence but acting wasn’t my golden ring, so to speak, it was directing film actually. Personally when it comes to film and TV I prefer being behind the camera! What actor or actress would portray you in a movie about your life? Penelope Ann Miller, the girl from Kindergarten Cop. People on the street tell me to stop all the time and ask if I’m her, it’s funny. In what TV series and movies did you play? I played acting roles in Batman, Hoffa with Jack Nicholson and Basic Instict Radio. Also I joined Ray Charles & Uh-huh girls for the Pepsi Campaign and his performance in the Super Bowl. I moved to Southern California and was a star struck. Took acting classes, performed in Musical Theaters. I love the atmosphere of the TV and film industry and got as close as I could get in any production that would have me. I tried our for any small part, walk-on or extra position that I could find. I wanted to learn as much as I could about the business of directing and creating for TV and commercial film. I made the most of my opportunities. If I can say that worked with Ray Charles in a Pepsi commercial for the Super Bowl, spent time filming with Jack Nicholson in the movie Hoffa, that I had a lot of fun working with Danny de Vito in Batman and freedom to act in it then I am blessed. In Basic Instict Radio with Sharon Stone and Michael Douglas it was a reward to the experience of being in a huge movie. It was worth it every single minute that they left in the movie. Being able to talk to Michael Douglas gave me so much vision. The industry is fast and complicated, but these stars can deliver an enormous expression of life in a short period of time. My delivery was more musical, and I realized my music could be expressed in a 3 to 4-minute clip. Did you ever write music for movies or TV? Yes, of course. “Out with the Girls” filled-in a country music show on The Voice this past year, but Supercuts is holding the song “Faith” both off my last CD, Movin On, for the possibility of a national commercial for their brand. From my perspective, my songs are perfect for shows in for example Nashville, which is in its first season and a national hit network. Your heart is clearly devoted to country music, what is your inspiration? There are two answers to this question Isabel. First answer is yes, country music is about the lyrics, it contains great folk language, with real people’s everyday stories. Reviewers have called me a story teller and I am flattered at that characterization, because that is what country music is all about. On the other hand I grew up in Cleveland, Ohio, and my first music influences were pop songwriters like Dianne Warren and the Beatles. I am and was a huge fan of my Ohio sister Chrissie Hynde (Pretenders) whom people have compared my songs with like “Faith”. I recorded a cover of the Pretenders tune “Don’t Get Me Wrong” for my up-coming CD Let It Go (ETATBA). My Country really leans to crossing over to Adult Contemporary, especially on my upcoming CD. It is true. Country was a direction that happened because of my love of songs and singers, and country radio was the first to respond to my recordings. My first great music breakthrough came when I covered the Patsy Cline song “Walking after Midnight,” for a radio contest “Out of Nashville” where my cover won the award over the established country singers, and received national rotation play on the legendary Radio Network. I’ve been accused of playing everything from pop to country blues, to rock (LOL) to traditional country to country rock, to Trisha Yearwood, Wynona Judd, The Eagles, Sheryl Crow, Shania Twain, Madonna and (yes it is true! )The Rolling Stones….maybe the truth is that all those influences have blended into my modern Country-Adult Contemporary sound and message? Your second and third albums are packed with award-winning songs. For whom do you write? On occasion I write about “someone,” but I am more the kind of writer that writes about something. Such as things and phrases I hear. I observe things that concern many people. Some people like to ascribe personal experience to the artist’s intent, but that is not ordinarily true in my case. The Awards, well there’s a few from each of my previous cd’s. “Possibilities” was my first cd and it’s loaded with great music; “That Town” is the one song that really got me going. It set the stage for breaking away from old places and habits that weren’t getting me anywhere. “Hearts of Time” is the title track to my second CD and it shines with hopes and visions of a better way. It has some of the best people working on it from both L.A. and Nashville at the same time. My third, and most positively-influenced CD is called Movin On. It has several great tunes that I think are most reflective of courage and confidence and show that what you truly desire can be accomplished. “Out With the Girls,” tells all the girls, poor, young, rich, and old to take a little time off and grab a night out on the town! “Faith” reminds us that sometimes we end up in the wrong situation or relationship and either we don’t know it, or we don’t want to know it. Whatever the case may be, if you have a little faith in yourself, you will find a way to write the situation. I love the song “Do I Dare” because it keeps me going for it. I keep trying like the song says, “to reach beyond my fingers”. Then there’s “Mr. Right Now”. Even though I didn’t write this song, it’s a fun song to sing and the ladies love it! “Mr. Right Now” is about having fun in your present relationship with no ties. I think asserting yourself, having faith in your ability and being willing to take chances and pursue opportunities are all things that I emphasize in my songs. I don’t necessarily think any of these ideas fit the definition of what some might consider political or social advocacy, but they’re important qualities in terms of reaching your goals. I know I have a lot of women in my audience and they repeatedly tell me that those messages reach and inspire them. How does it feel to have the best song written? It starts somewhere, tell us more. I always loved music. Listening gave me direction and my bravery to follow it. As I grew, music gave me a way to express myself and share what I have learned and what I still hoped for. I try very hard to deliver that freedom with my music today. I worked in the middle years in Hotel Management. I was able to interact with others and exercise leadership, but it was always a predetermined adventure. It was gathering together to carry out someone else’s wishes. I liked that I was able to recognize myself in other people and their approach to each journey, but I always found myself a bit shy when it came to sharing those views or feelings. When I began working in the entertainment areas of the hotels, booking the artists and performers, scheduling them for the right events, it reminded me just how clearly music communicated to its audience. That’s when I knew I wanted to bring music, my own music, to the front of whatever I tried in life. Once I began doing that with my own singing and song writing, the hotels began booking me, and the response was overwhelming. It didn’t take long after that for me to want to continue writing and performing full-time. It’s what gave me the ability to accept success with joyous reward, and failure with repair and resolve It was also nice to be acknowledged for my music by winning Americana Album of the Year in 2009 and “Dance Single of the Year” in 2010, both at the L.A. Music Awards. My first national success came from participating in a country music radio contest. Carey’s energetic cover of Patsy Cline’s “Walking’ After Midnight” took off after a very impressive debut on Blair Garner’s syndicated “After MidNite” Country Radio show, which airs on stations in major and medium markets all across the United States. To be the only independent artist on the same list with major-label artists, and having your song picked by the fans what more could you ask for! What more can we expect? Movie or Music? Music of course! I am putting the finishing touches on my 4th CD Let It Go, and developing the release campaign this spring and summer. I’ve recently been re-elected to the Supercuts #RockTheCut Artist Ambassador program for the second year, and they gave me a huge e-mail shout out in October 2012, and “Faith” is on the short list for their commercial branding use. “Out With The Girls” will follow, both are off the last CD Movin On. Therefore, I have hired A&R Select of Sherman Oaks, California to conduct a CMJ College Radio campaign for the next couple months on a number of those songs off the award winning CD, including “Faith”, “That Was Her This Is Now” and out with the girls. 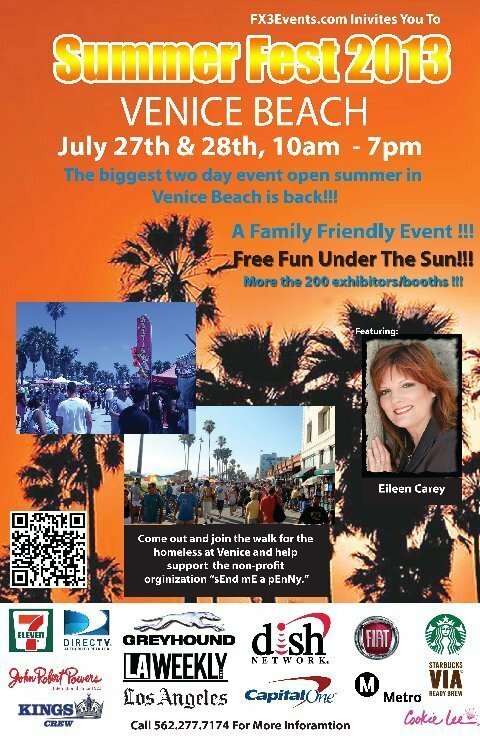 Starting to book this summer’s festival season, and is being featured this summer at the 5th Annual Summer fest on Venice Beach for the Make A Wish Foundation on Sunday July 28th www.fx3events.com. This is big event and I am very proud that I am singing on this festival. I plan to do more radio performances and interviews, and have over this past winter been featured on a number of talk radio shows, terrestrial as well as online, such as: Take2Radio.com (“broke record for hits and continued to be downloaded or listened to 82000 times” –tk2radio), Carolyn Fox’s Hollywood Spotlight, Michelle Jeanne Hot Mix 106, Pepper J’s Actors E-Chat, Gus Summers’ the IN show etc..
2013 is going to be a pretty exciting year for me as I’ll be releasing a new album. I’ll also have a new dance single coming out sometime this year for the Country dance saloon clubs. That will be a whole lot of fun. Performing will be high on my list of priorities in 2013 as well. I’m scheduling all over California and across the Southern U.S. I am more than open to do Europe, but it would take a very competent promoter and an airtight booking schedule! Not to mention a continental distributor wanting to support those engagements. When I put a smile on someone’s face. I think life is a treasure chest of journeys. Most have fantastic awakenings. Others, are sometimes very difficult to travel through. I make a journey of every song. I find a way to open the doors along the way and offer a ride to anyone heading in a similar direction. Or maybe having been there before, go a new way. It’s a way to share feelings and experiences that have affected where we are or where we are going. I like my music to be lifting, to impress hope with strength and determination. Whether you need a little or a lot, I like to think my songs can light a fire under your seat. Is there something you want to share with us about passion and dreams? “Passions” and “dreams” they are the engine of all great accomplishments. I have been incredibly fortunate to have a successful career in music as a recording artist, musician and songwriter. Finally, did your dream come true? Yes, some of it has, but as I said, I am still and always pursuing dreams, though so many of them have come to fruition. Let’s face it hearing yourself on the radio, performing in front of crowds and being able to be bi-coastal (Nashville is Eileen’s other home at times), winning awards and having the respect of my family and my colleagues is definitely a dream come true! In my world I like to have dreams build on one another, and who can stop dreaming new dreams when so many of your dreams are coming true? I want to thank Eileen for the time she took in answering my questions. My goal was to give my readers an inside look of this wonderful artist. It was a pleasure to get in touch with her and after reading this interview everybody knows why. Despite the fact that Europe is not on her list yet, maybe this article will help to open opportunities in Europe. I will keep in touch with Eileen in hopes of reporting any upcoming shows that might take place in Europe, so stay tuned. Two-time Los Angeles Music Awards (Americana Album of the Year 2009 & the 2010 Los Angeles Music Awards “Producer’s Choice – Dance Single of The Year”) winner and South Bay (L.A.) Music Awards Recipient. International Airplay in Japan, Germany, Australia, Sweden, Canada and Serbia for Movin On. Performance at Nashville’s Country Radio Seminar (CRS) Show received high accolades from the radio industry audience.